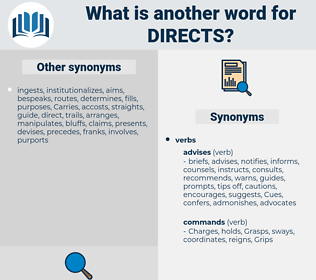 What is another word for directs? hits, seeks, pays, deals, directing. 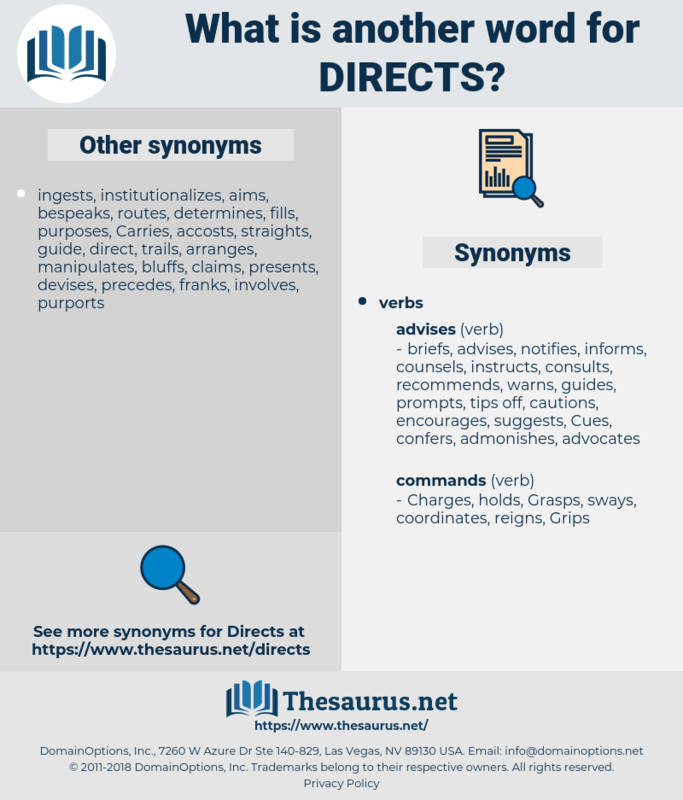 directives, directions, directors, guides, issuances, decrees, Addresses, indicators, shoulders, freighters, indications, commissions, invites, Drives, dependants, Charges, prompts, tasks, routes, mandates, heads, points, loadings, Grips, paddles, functions, Workloads, pushes, draws, signs, entrusts, instructions, seeks, manages, administers. directorate, predicts, distributes, coordinates, depicts, concentrates, credits, articulates, determine, determining, determines, dictates, Indicating, indicates, dedicates, elects, disseminates, identify, identifies, incorporates, introduces, decides, declares, illustrates, guidance, supervises, demonstrates, dispenses, reflects, investigates, presides, mentions, Affects, contributes, afflicts, confirms, disposes, enacts, appropriates, communicates, attracts, conductors, discusses, attributes, influences, enunciates, proscribes, pertains, dismisses, cites, organises, directions, includes, references, consecrates, steers, generates, caters, necessitates, devotes, contends, advises, provides, renders, entitles, forwards, targets, subjects, allocates, relieves, undertakes, constrains, encourages, regulates, creates, recognizes, guide, guided, guiding, removes, entrenches, contemplates, proclaims, establishes, commits, anticipates, ascribes, explains, informs, expects, intends, alters, clarified, clarifies, connotes, oversees, prescribes, transmits, elaborates, defines, remits, examines, symbolizes, confers, rules, Trustees, presupposes, relates, induces, strives, contains, governs, orients, asserts, utilizes, catches, conjures, monitors, defers, suggests, controls, Travels, obligates, ordains, turns, fosters, invokes, appoints, operates, waivers, pinpoints, Recalls, enshrines, enforces, secures, stipulate, stipulates, conveys, envisions, owns, alerts, obviates, Strikes, outlines, presents, denotes, endorses, involves, compiles, spearheads, relegates, imposes, observes, invite, proposes, entail, Entailed, entails, Faces, invests, refers, tackles, alludes, teaches, tends, Lends, chooses, affirms, resembles, formulates, captures, assigns, exhorts, obliges, Focuses, focusses, notes, overload, compel, compels, consumes, arrives, encloses, specifies, tells, endows, accuses, avoids, envisages, notifies, returns, expires, cautions, displays, shifts, engages, arranges, evokes, exempts, relies, impels, forces, enjoins, Leaves, spends, binds, extends, urges, resolves, submits, attaches, embodies, aims, brings, forecasts, foresees, sets, inclines, reveals, maintains, espouses, files, is, manager, Bears, raises, quotes, insists, Levies, affords, yields, remands, assures, prepares, expends, reads, occupy, occupies, causes, relays, handles, cares, Grants, alleges, places, pursues, performs, serves, throw, warns, depends, develops, awards, argues, OPTS, Carries, treats, sees, uses, lays, hints, fills, speaks, Gives, signifies, aligns, moves, Accorded, accords, signals, implies, works, embraces, takes, honours, releases, lists, allows, allots, upholds, fixes, funnels, possesses, gears, agrees, wears, employs, bids, prays, guides, warrants, holds, Plays, says, decrees, hears, Addresses, puts, walks, launches, passes, goes, commissions, plans, builds, boasts, Has, invites, sorts, states, Drives, Charges, prompts, wants, runs, routes, mandates, pulls, shows, heads, points, 's, commands, pushes, makes, draws, entrusts, instructions, hits, seeks, pays, deals, manages, administers. This is a spirit divine, who in the way Of going up directs us without asking, And who with his own light himself conceals. To the hidden force that directs all things. draught, dry socket, drogue chute, dearest, drought, dyer's weed, dressed, detract, dress out, diarist, dress hat, drag out, derogate, draughty, dress code, Dyer's Woad, dry-shod, directed, drugged, drogheda, dark-coated, druggist, drugget, dress suit, direct dye, direct tide.